Dhaka, Bangladesh. 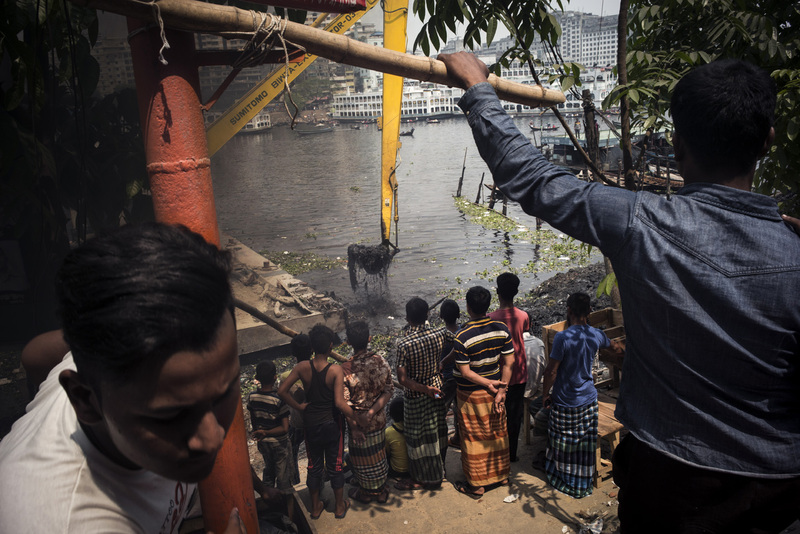 In the Keraniganj district, the BIWTA (Bangladesh Inland Water Transport Authority) cleans the shore around a pier for barges crossing the river. The residents are witnessing the demonstration, which they feel is more like an event related to the current election campaign. Dhaka, Bangladesh. Dans le quartier de Keraniganj, la BIWTA (Bangladesh Inland Water Transport Authority) nettoie la rive aux alentours d'un embarcadÃ¨re pour les barques qui font la traversÃ©e de la riviÃ¨re. Les habitants assistent Ã la dÃ©montsration qui, selon eux, ressemble plus Ã un Ã©vÃ©nement liÃ© Ã la campagne Ã©lectorale qui es en cours.